48 hours to produce the first issue of a magazine. An ambitious goal meet by a few friends and 1000's of content contributors over a weekend in May. 48 Hour:Hustle, a print on-demand magazine, was started on May 7 and issue zero was wrapped on May 9. The cease and desist letter from CBS Broadcasting, Inc. was received May 11. (I calculate 48 hours between release and demand letter...irony). CBS owns the trademarks for "48 Hours," "48 Hours Mystery," and several other similar marks with "48 Hours." The CBS marks are in Class 041 for a television series. 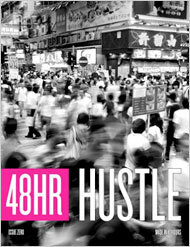 Would a consumer be confused that a magazine named "48 Hour:Hustle" was from the same source as the television show? I also wonder if an argument could be made by another trademark owner for likelihood of confusion with their mark: Hustler. The hit musical "Jersey Boys" has been the subject of a copyright infringement/co-owner lawsuit, as previously discussed here and here. Changing hats from being the defendant in a copyright infringement suit to "singing the tune" of the plaintiff, Frankie Valli, Bob Gaudio, and the playwrights of the musical "Jersey Boys" filed suit against "The Boys in Concert" tour, alleging similarity of songs, stage elements, and logos. According to news reports, the plaintiffs are seeking an injunction against further performances of The Boys, $150,000 US for each of 10 songs from Jersey Boys used in the show, and additional unspecified damages. More information about the suit can be found here. Lucasfilm, Ltd. and Lucasfilm Entertainment Company, Ltd. filed a lawsuit against EZ2Fly, Inc., et. al for the manufacture and distribution of unauthorized merchandise that are remarkable similar to authorized STAR WARS branded toys. Lucas alleges EZ2FLY advertised and sold a replica of the STAR WARS X-WING STARFIGHTER online and at trade shows, titled as "X-WING." The plaintiffs also allege the STAR WARS theme music was played in connection with advertising for the products. The complaint, filed April 8, 2010, in the Central District of California, alleges copyright infringement, false designation of origin and false description, trademark infringement, state common law trademark infringement, and unfair competition, among other claims. Once again, the Blawg Review has generated a fantastic selection of dynamic, informative and often funny law related blog posts for 2009. You can read the summary here and be sure to scroll to the bottom for directions on voting for the Blawg Review post of the year. If anybody is interested, my contribution for this year it is #212 and can be found on my blog here (a tribute to the greatest country western song ever). A special shout out to Ed and the Sherpas at Blawg Review. It is a lot of work to pull this together every week. Thanks gang for making it happen. "You Don't Have To Call Me Darlin,' Darlin'"
When I teach music publishing classes or seminars I always give an example to explain the difference between an idea and the expression of an idea. The expression of the idea fixed into a tangible medium is what is protected by copyright law. My favorite example is to tell the class they each need to write a song that includes these ideas: trains, rain, momma, jail and pickup trucks. (Yes, lyrics still count). In the end they may all come up with something completely different and each original work would be protected by copyright law. Even if those same ideas are found in another song … the perfect Country & Western song. Sometimes it seemed so useless to remain… We don’t know for sure if he and “darlin” are married, but in Texas it could have been a common law marriage. Watch out during those divorce proceedings for taped phone calls and emails showing up in discovery says the New Jersey Law Blog. The Alabama Family Law Blog makes it clear it takes two to tango but only one spouse to get a divorce. You never even call me by my name… As a trademark/branding lawyer one of my clients' biggest concerns is being called by the right name and making sure no competitor is using the same or similar name. Check with the Los Angeles Trademark Attorney Blog to see if it is the "The Girl From Ipanema" wearing that IPANEMA tagged swimsuit. Over at the TTABLOG we can voice our thoughts on Lamb's vs Lam for rum. Las Vegas Trademark Attorney Ryan Giles asks will the real Andre Agassi and Stephi Graf stand up now that their cybersquatters are down? Mr. President, please do not be confused by those pending OBAMA trademark applications in the EU as reported by the IPKAT. And Google, what are you doing now with those crazy adwords? Read the update from IP lawyer Ron Coleman on the Texas class action against Google. This week is the Annual International Trademark Association Convention in Seattle so I am giving a special shout out to Seattle Trademark Attorney Michael Atkins comparing the Space Needle to the Rock 'n Roll Hall of Fame. Just make sure she really wants you hanging around because GPS can now be attached to stalkers. Watch out for those signs, too. Like Woody Allen, sometimes your picture might be associated with something you oppose. This additional verse that makes the song the perfect country and western song, also makes it o-so perfect for Blawg Review…. Did he say drunk and prison in the same line? You better see what my Twitter colleagues have to say at the Criminal Defense Blog, the Simple Justice Blog and the Defending People Blog. Trains, people and trucks rarely make a good combination. See what the Chicago Injury Lawyer Blog has to say about a recent train accident. Read here about the man charged with DUI in a car/train accident. Also, no texting while driving the train. Now I realize I have written the perfect Blawg Review post. You don't have to call me Darlin,' Darlin' .... just call me lawyer Tamera H. Bennett. UPDATED 5/18/09: American Apparel and Woody Allen settled for $5 Million after this Blawg Review went to press. Read more here.